Punk knows exactly what it means to push through the ranks. The Overwatch League has laid out one of the clearest paths to go from bedroom gamer to stadium champion in esports. There are other leagues that have set up a similar flow, but none of them make quite as much sense as moving through the ranks of Overwatch. You start out in game, grinding your way through one of the smoothest ranking systems in gaming, and then you crack the top tiers and start competing in the Open Division. Before you know it, you’re a Contenders champion, fielding offers from Overwatch League teams wanting to move you across the country, or in some cases, overseas. When it’s written like that, making it to the top of the professional Overwatch world sounds simple—which is a testament to what Blizzard has done to make its league work from the grassroots up. Leyton “Punk” Gilchrist has completed that exact grind and is on the cusp of breaking into the Overwatch League. He’s signed with Boston Uprising and their academy team. Punk also helped Australia qualify for their second World Cup finals and has his eyes set on the Overwatch League. Punk took some time out during the Contenders finals weekend to chat about the importance of the Path to Pro in his career. How did it all begin for Punk? Why Overwatch? Punk: Firstly, I simply love the game. Once I realized this, I started climbing rank in AU, and found myself hitting high grandmasters level. I was also watching some tournament play online, and it really looked like fun and something I’d like to do. I started letting people know I wanted to be on a team. You won’t believe this, but one day, a guy called Funk reached out to me (Punk). He had a slot open on a team called the Mackerels (this was pre-Contenders days). They trialed me, put me on, and we started scrimming (I think only Mini from that team is still playing today). After Mackerels, I joined Dark Sided, who were then just an Open Division team. Right after I joined them, I also went to the 2017 World Cup Group Stage in Sydney, sat in the stands and just never thought that I’d be in the World Cup team the following year. When Contenders was announced, we qualified for season one, finished top of our group, but lost out to the Drop Bears 3-2 in the semifinals. Anyway, in season two, we again finished on top of our group, but went down again to the Drop Bears, but this time on stage in Melbourne in the grand final. Yep, after I qualified for the 2018 WC team, I met up with the other team members in Bangkok for the group stage. This is where I met Gunba and Custa for the first time face to face. Chatting with them helped me to decide I really wanted to play Overwatch seriously and professionally. You previously competed with the Sydney Drop Bears in the AU contenders. How do you think that experience set you up for your move across to NA? Well, I was actually trialing with NA Contenders teams after the Bangkok group stage (well before Sydney Drop Bears were a consideration). I trialed long and hard in the lead-up to BlizzCon and the World Cup finals. Just before our game against South Korea, I drove across LA to do yet another trial, but of course on low ping for the first time. It was probably after Bangkok and qualifying for BlizzCon, that a few of us first started talking about maybe sticking together for next Contenders AU season (a few of us also continued the trials grind well after World Cup finals). So, I really think the World Cup was personally what set me up more for NA. It just wasn’t until the start of season three AU Contenders that I finally felt like I was headed to Contenders NA. The World Cup has certainly had an impact on a lot of players and their careers. How has it been playing with Boston Uprising and being a part of that system? Yes. It’s great to be on a team with players and coach from other countries: A Frenchman, an Argentinian, a Pommie, a German, and a couple of Yanks. Lots of cultural diversity makes for some very interesting chats in the team house. It’s pretty cold in Toronto at the moment (-15° Celsius is the top temperature some days) and getting the guys motivated to come to the gym with me is a bit tough, but you’ve probably seen in the socials how much fun it is. Are there any major differences you have noticed between the AU and NA scene? Of course. Individual player skill levels are much higher in NA Contenders. There’s also a greater variety of teams to scrim against, and you get to play against OWL players frequently in ranked. It’s super fun and has really helped me develop my own skills even after such a short time so far. What do you think the ANZ region needs to do to bridge the skill gap between themselves and NA? Somehow, increasing the number of Australian players is needed to help grow the player skill levels. 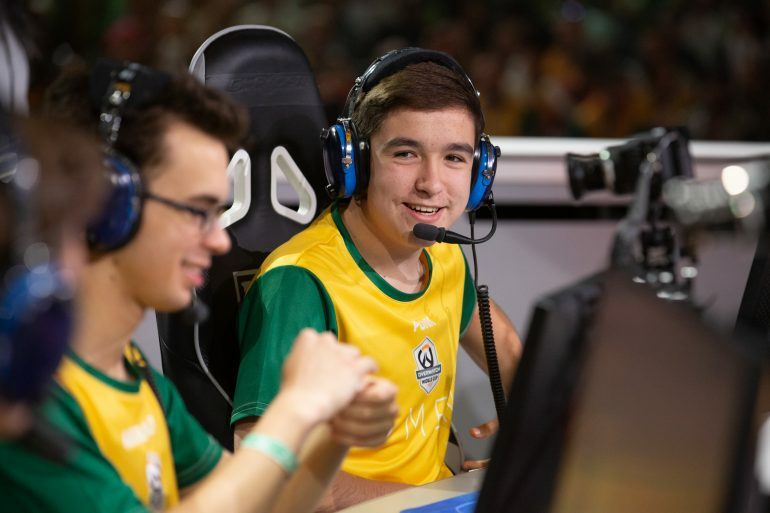 The recent announcement of Contenders competition changes and of the cross-regional Contenders teams playing against each other should help generate a level of interest from more Australian players. Also, having people like Custa, Gunba and RQT dedicating themselves and their time to helping Australian players get noticed is such an important part. Down the track, others will also have to pitch in and help because we can’t simply leave it to these guys alone. How important has the Contenders system been for you? Well, I’m still in Contenders, just in a stronger region now. Contenders has given me the experience of playing LAN and on stage multiple times, of living in a team house, participating in boot camps, meeting all kinds of people, and traveling to different cities. Hopefully, all of these experiences help me get into OWL when I turn 18 in October this year. If you were a young player, or even a Contenders player looking to push their career, what advice do you wish you were given earlier? Networking is so important. I’d suggest you get to know as many people in the scene as possible and find the right people that will take the time to give you good advice. If you’re still at school, having your parents’ support is also something you need to get sorted out. There are some changes coming to Contenders 2019, but you still have time to grind your way to the top before the season begins later this year.